Historical interpreter Jessica Carcich will play music of the 18th century on violin December 26, 27, 28 and 30, 2015, at the Yorktown Victory Center, soon to become American Revolution Museum at Yorktown. 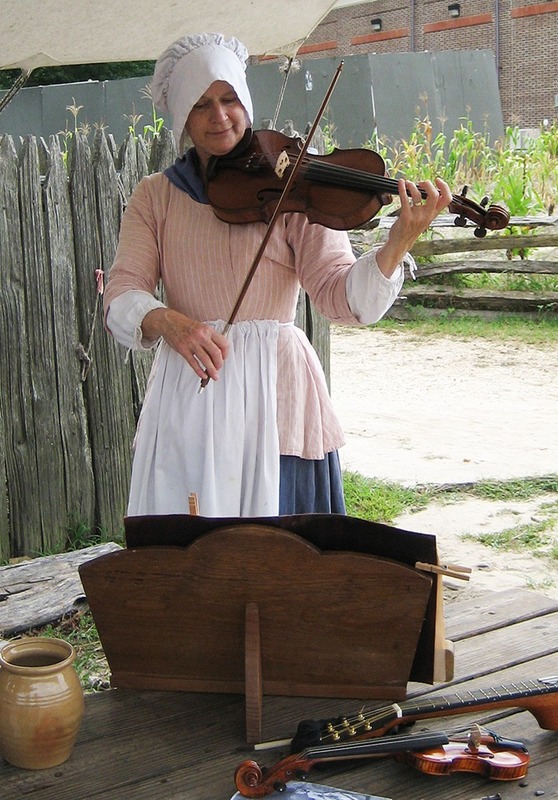 Music performed at home and in public played an essential role in the cultural life of 18th-century Americans. American colonists adapted new verses to old familiar British and European tunes, and regional styles and preferences developed in the southern colonies, the middle colonies and New England. After the Revolution, informal amateur music gradually gave way to a more professional, commercial musical culture with distinctly American themes. Music was performed in churches, at public concerts, for ceremonial and military purposes, as accompaniment to theater performances and public balls, and as a source of entertainment in taverns, where innkeepers usually kept instruments on hand. During the Revolution, groups of professional musicians were paid by military officers to perform for American, French and British regiments. Music-making also flourished in homes at every level of society. Lower- and middle-class people sang popular songs and traditional ballads and danced to the music of fiddles at family gatherings. Members of the upper class, for whom balls and musical performances were an integral part of social life, learned to play a variety of string and wind instruments and perform formal dances. Drawing from African musical traditions and European influences, enslaved people sang while they worked and fashioned drums and banjos to accompany after-hours singing and dancing. The American Revolution spurred the popularity of patriotic songs and exposed Americans to high-quality military band music, profoundly influencing the development of music in the new republic.